Maintain buy with a higher fair value (FV) of RM1.35: We raise our financial year 2019-2020 forward (FY19-20F) forecasts by 2.4% and 2.2% to RM149.2 million and RM155.5 million respectively. We also introduce our FY21F earnings forecast at RM160.1 million. We maintain our “buy” call on YTL Hospitality Real Estate Investment Trust (YTL REIT) with a revised FV of RM1.35 (from RM1.32) based on an unchanged target yield of 6.5%. The earnings upgrade is to reflect the improved prospects of key assets of YTL REIT. We are positive on its earnings outlook in FY19-21F, underpinned largely by: i) a strong performance from the Australian segment, with year-on-year (y-o-y) increase in average daily rate of the Marriott Hotel in Sydney; ii) master leases with a 5% step-up clause for properties in Malaysia and Japan; and iii) the newly acquired Green Leaf Niseko Village Hotel in Japan, which will provide additional income to the REIT. In August 2018, YTL REIT proposed to acquire Green Leaf Niseko Village Hotel from an indirect subsidiary of YTL Corp for ¥6 billion (RM225 million). 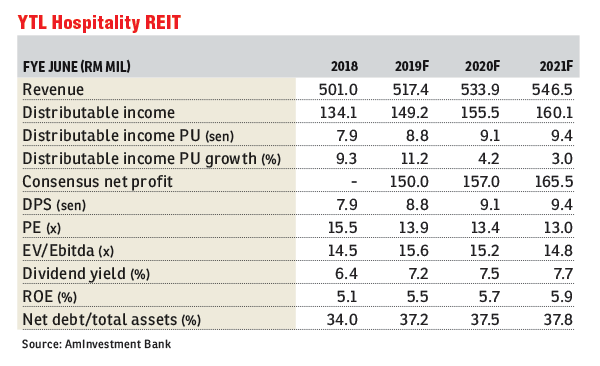 YTL REIT will subsequently enter into 30+30-year long-term lease with the vendor at an initial gross yield of 5.25% (annual revenue of about RM12 million). The acquisition is expected to be completed by the end of first half (1H) of FY19 and will begin its contribution from 2HFY19 onwards. Master leases with the 5% step-up clause continue to provide stability to the net property income (NPI) for hotels in Malaysia and Japan. For FY18, 52% of the NPI was derived from hotel assets under master leases (Malaysia and Japan). These provided stable, and highly visible earnings streams while three hotels in Australia contributed the remaining 48% of NPI. The acquisition of Green Leaf Niseko Village Hotel will increase YTL REIT’s net gearing to 37.2% from 34.0%, still below the regulatory threshold of 50%, hence providing more room for further expansion. Overall, we are “neutral” on the REIT sector over the next 12 months. Prospects for the sector are expected to be subdued, especially with potential overnight policy rate hikes in 2018 as well as muted rental reversion opportunities affected partly by the oversupply of retail and office spaces. This article first appeared in The Edge Financial Daily, on Sept 6, 2018.